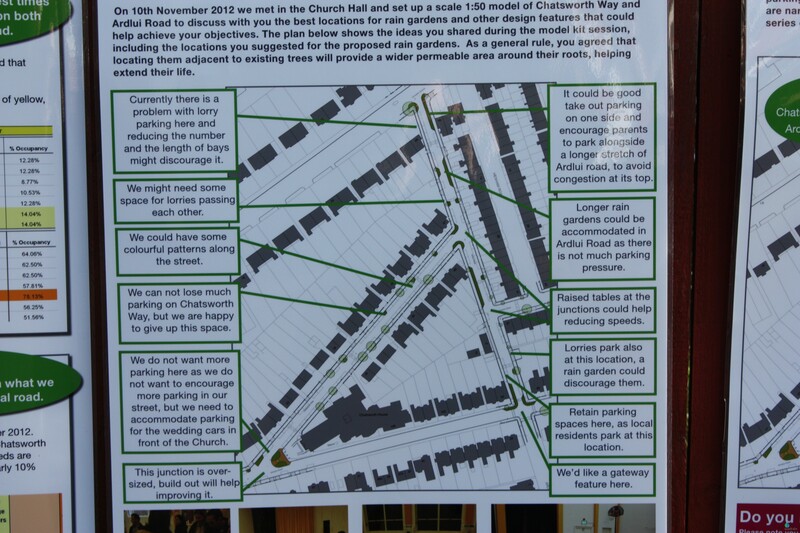 Saturday 26 January 2013 was the third public consultation meeting on the Lambeth Green Streets project. Despite threats of snow and rain we were greeted with a fresh sunny morning for the “drop in session” on the junction of Chatsworth Way and Ardlui Road. 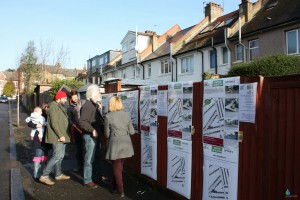 Representatives of Sustrans (Ben Addy and Paola Spivach) met the local residents to talk them through the process to date and discuss some of the design options that following residents input may potentially be implemented in their area, with it being made clear that nothing has been decided and they wanted to be guided by the residents. Myself and Owen Davies from Lambeth Council were at a respectful distance so as to not over influence the process and observe reactions, pretty much only speaking to residents when we were spoken to. The friendly (and very occasionally spirited) exchanges between the residents and the team from Sustrans seemed effortless. 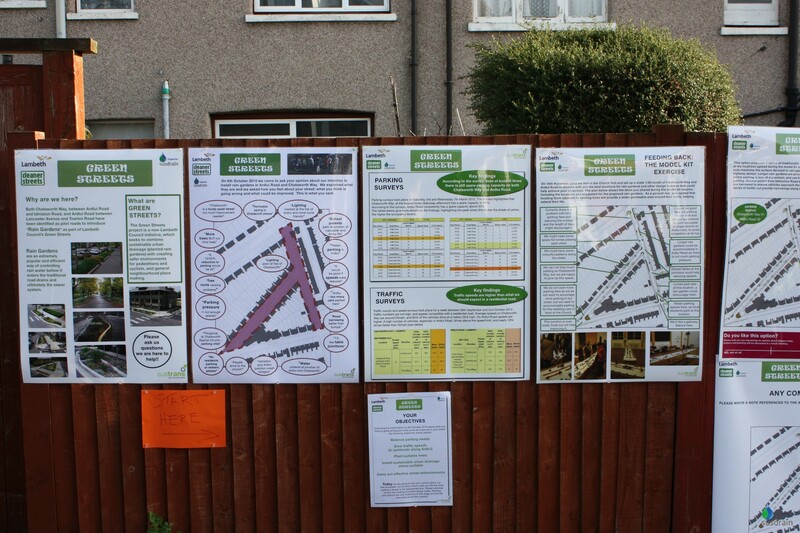 Largely encouraged by a warm and empathetic approach it had the feel of a process where Sustrans and the Council were working “with” the residents and valuing their input, rather than something being “done to” them. 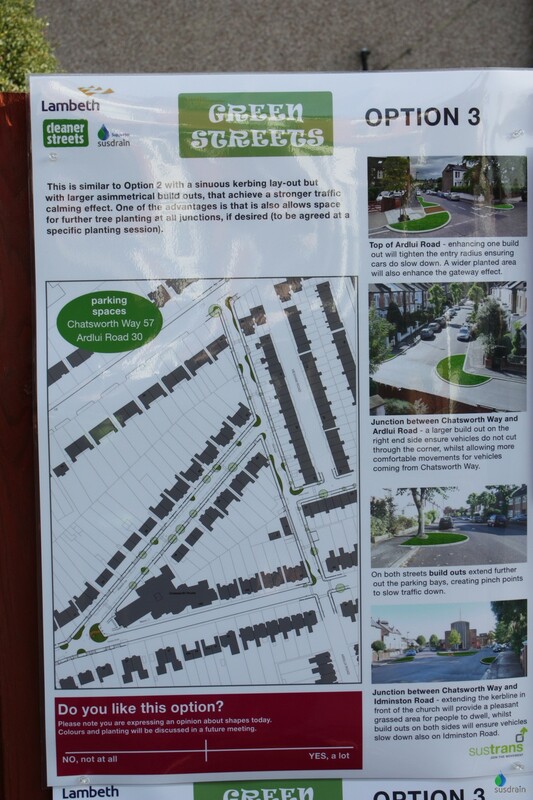 The Green Streets project has been identified for the area to help manage problems with surface water runoff from the local area contributing to flooding lower down in the catchment. 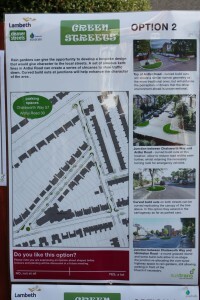 There are also opportunities to introduce traffic calming measures and urban green infrastructure. This type of intervention has the potential to deliver cost effective multiple benefits by providing opportunities for surface water management, highway management and delivery of green infrastructure. Detailed modelling analysis (for that specific catchment and ideal ground conditions) has suggested that for a worst case winter scenario of 1:100 rainfall event with low infiltration (plus climate change) runoff flow/volume is reduced by 37% by the green streets approach. There was a steady trickle of residents attending the drop in session with interest from Ben’s collated contacts. Newsletters are emailed and Ben braved the snow to post leaflets through residents’ doors. More recently a blog has been developed sharing thoughts and providing a more immediate way to engage and respond to residents’ queries. The drop in session included posters with a description of the green streets approach, with information and images from the programme in Portland, Oregon (in the US). Information about parking statistics as well as vehicle speeds on the local roads was also provided. The parking surveys (vital when introducing changes to the street scene) suggested there was some spare capacity, particularly on Ardlui Road. The traffic counts and speed surveys suggested that the average speed (85th %ile) is higher than expected for a traffic calmed residential road. Feedback from the last workshop where residents were encouraged to place post-it notes and comments on a 1:50 map and model were available for a review. This information had informed the development of three design options for the green streets approach which were presented together with potential options for road surface painting. Traditionally shaped build outs at locations previously suggested using the scaled model. 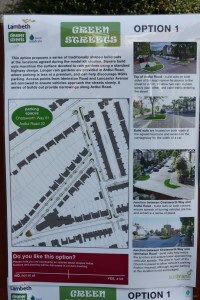 Longer rain gardens are proposed for Ardliu Road where parking is less of a challenge. Access points from neighbouring roads are proposed to slow down vehicles and there are number of build outs proposed along Ardlui Road. Sinuous kerb lines in Ardlui Road creating a series of chicanes to slow traffic down. Curved build outs at junctions will help enhance the character of the area. Similar to option 2 with sinuous kerbing, but with larger build outs slowing down traffic. This also allows further tree planting (if desired). 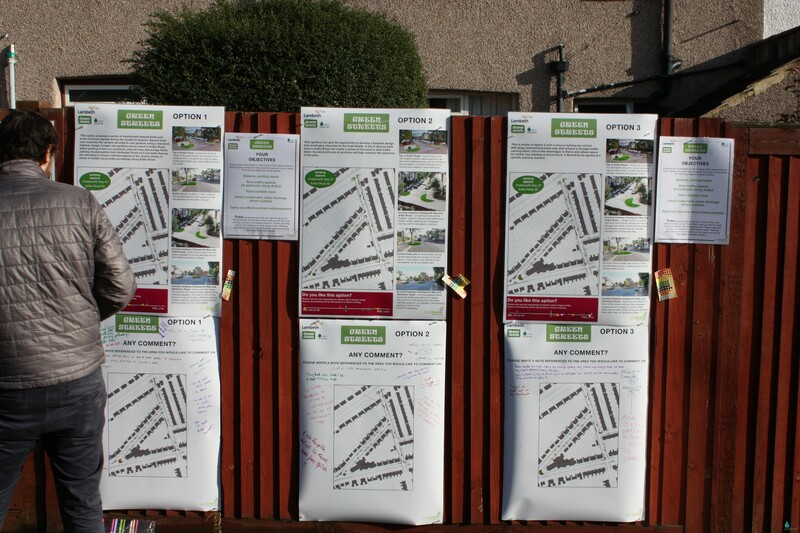 Opinion and suggestions from residents were written on posters, with comments pinpointed to specific locations. 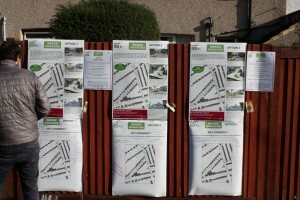 Residents were also encouraged to place stickers on a scale to present their agreement for the options. Overall, option three seemed to be the most popular design approach, which seemed to accord with the sentiment that if there are going to be build outs they should calm traffic and reduce vehicle speeds. The main concerns raised related to the loss of parking on Chatsworth Way. 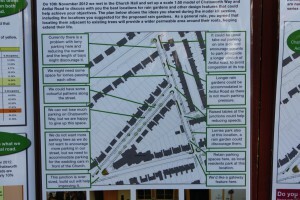 This feedback will inform future decisions and a revised scheme will probably be presented to the residents. The buildouts on the options were presented as grass, there was concern that these were a little bland and probably would not deter those with ‘chelsea tractors’ driving over the build outs. It was explained that the residents would have a chance to influence the planting. The Council would pay for the planting and a basic level of maintenance, however if they wanted extravagant planting that the community may need to get involved in maintenance (which does happen in the US and parts of Europe). One resident did express some light hearted concern about introducing an element of competition over the planting and upkeep of any build-out outside their house – jokingly suggesting it was tantamount to public blackmail and somewhat “tyrannical”. 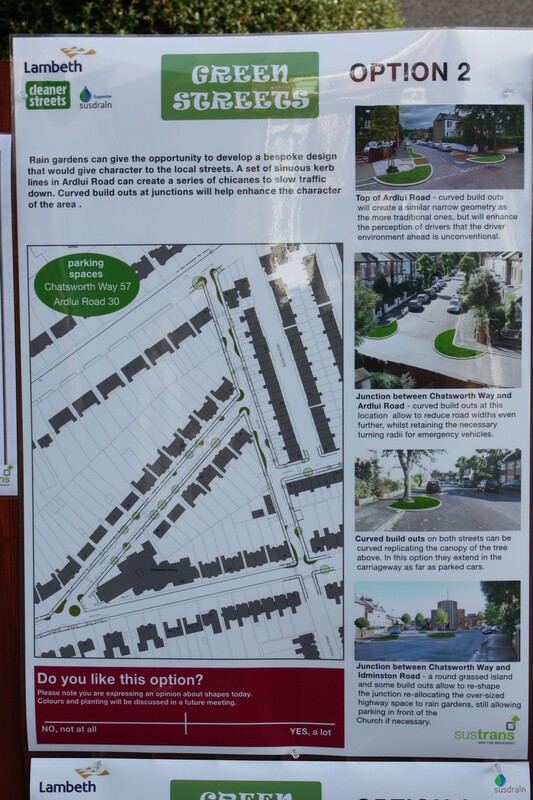 There was, however, pretty much universal rejection of options to paint the road surfaces, with residents providing suggestions on how any savings from not painting the road surface could be spent. Since the event on Saturday Ben has posted a number of immediate clarifications on the blog responding to comments raised on the day and subsequent emails. The next design session in March should be very interesting.